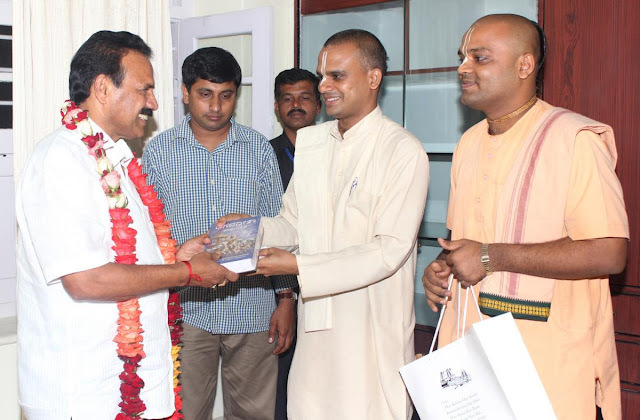 Devotees of ISKCON Bangalore met the Honorable Chief Minister Sri Sadananda Gowda at his residence and presented to him Sri Prahlada Narasimha(presiding deity at ISKCON Bangalore),prasadam garlands and Srila Prabhupada and Bhagavad-Gita as it is Kannada version. Devotees appraised him of various upcoming and ongoing initiatives of ISKCON Bangalore. He appreciated the various activities of ISKCON Bangalore especially Akshaya Patra. He warmly welcomed the devotees and said that he will support all the initiatives of ISKCON Bangalore.